If you missed Part I and Part II of the Psybient mix series, it’s not too late to get in on the fun. 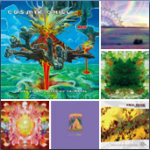 Here’s the third and final installment of the Spring 2010 Psybient Mix for flow spinning. This mix starts off with the haunting sound of Mungasid delivering the “Crying Spy” Track off the Cosmik Chill: Red album. This track has such an amazing beat to flow to and really transports my spirit as I’m dancing — it is simply lovely. The mix continues with “Manakhana” with some distinct psychadelic music sounds punctuating the rhythm and then flows into the third track, “Secret Fire” with flute sounds that remind me of Jethro Tull and a beat that makes me feel like the track is almost Psy-Funk. It’s a fun track and a bit more on the upbeat side of things than the chill side. “Duby Cure” reminds me of some old school Sasha and Digweed from Northern Exposure, though with better sound quality. “Butterfly Ritual” has a slightly grittier sound which super fun to dance to. Next is the longest track of the mix, “Chai Phone,” which can be easy to trance out to and catch a few fun rhythms to flow to. The dub sounds on the appropriately named “Kim Dub (Phonic Mix)” are slow and inviting with a deep sound that fills the track with interest. In the home stretch of the mix is “Happy Leary,” a track that is perhaps too upbeat to really be an ambient track. Still, it’s fun to play with and inviting for those who like psybient music. The mix ends with “Numbers,” perhaps my favorite track to get down to in the mix, which is saying something because I think this may be the best of the three parts of this iMix series. Hope you enjoy these tracks as much as I have! You can sample these tracks and purchase legal copies through this iTunes Playlist.